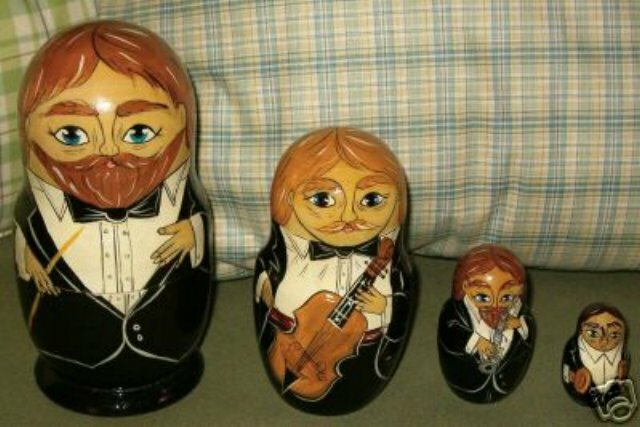 Russian Nesting Doll features an orchestra group, each with different features and the different hair colors make each look quite unique. There is a brunette, blue-eyed symphony orchestra conductor; blonde, blue-eyed cellist; brunette, blue-eyed clarinetist; and a black-haired, blue-eyed percussionist (cymbals). A nice different Russian nesting doll – sizing from 6.5” down to 2”.